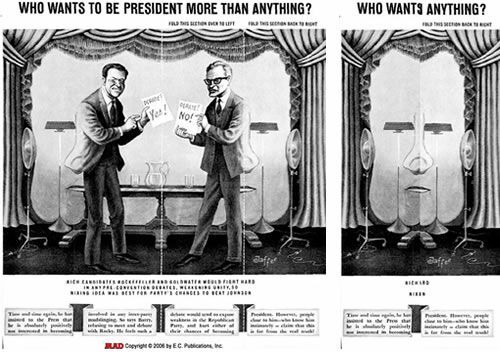 Over 60 years ago, legendary cartoonist Al Jaffee started applying his satirical pen to the pages of Mad Magazine. At 95 years of age he still contributes the “Fold-ins” that he invented in 1964, and now holds the world record for Longest Career as a Comic Artist. In a recently published interview with The Guardian’s Sam Thielman, Jaffee discussed the vital role of satire in deflating “bloviators” of all stripes. We have to be inventive to expose them, not to insult them, but simply to take what they say and expand on it to the point of ridicule. It’s enjoyable, and in a way we think it’s kind of a public service. We don’t favor one particular politician over another, we’re just looking for the politician that’s trying to pull the wool over our eyes and just exaggerate what they’re saying and then it speaks for itself. Jaffee admits, however, that in the current political climate satire is increasingly outpaced by the politicians themselves. Whereas in the past a politician might have promised “jobs for everybody in the country within two years or something like that,” today he says “they claim that they’re going to make jobs for everybody on Mars. It’s just so outlandish.” Additionally, as political satire proliferates online and in other media, every individual outlet has to continually outdo itself and its competitors, he says. There is no direct connection there. Juvenile delinquency was probably created by poverty more than by comic books. There was an inquisition and a lot of people lost their jobs and fortunes were lost by comics publishers and the Comics Code came about, which in some ways I think helped the industry but in other ways hurt it. I don’t think censorship in any form is useful. I think that healthy discussions are more important. Even though Jaffee still puts in about two weeks of work on each fold-in for Mad, he says he “enjoy[s] working almost as a hobby now” and feels that “I’m lucky to be able to pick up a pencil, let alone draw the damn thing.” Check out the full interview here at The Guardian, as well as some interactive online versions of original Jaffee fold-ins here at The New York Times.